The chances are this Easter Sunday is going to be a rainy day, so our annual Easter Egg Hunt is likely to be indoors. An egg hunt is a good way for us to keep the kids busy while the grandparents are finishing their roast dinner – and it gives the kids a chance to run around after having been on their best behaviour during the meal. For a bit of fun (and because my kids are terrible at finding things!) I’ve made up some silly clues to help them track down their eggs. I’ll write them out on some egg-shaped cards, leaving off the last word of each clue so they have to guess what it is. We don’t want to make it too easy for them, do we? Here are the Easter egg hunt clues so far – any suggestions for a couple more? How about ‘you’re going to have to use your head, there’s one egg hiding in your (bed)’ ? Try to think of Mother Hubbard, this one’s hiding in the …(cupboard). Don’t be lead down the garden path, this eggs upstairs in the …..(bath). Thanks Sue – keep them coming! 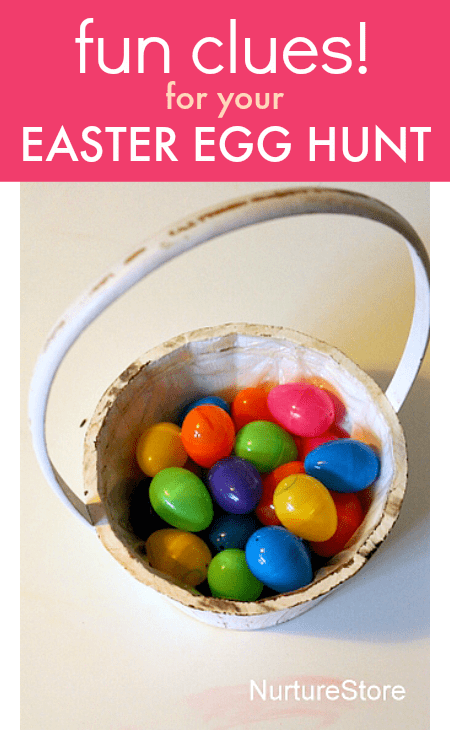 I love this idea – treasure hunts like this make easter so much fun for kids. I’ve just woken up so my brain isn’t working enough to come up with clues 🙂 I’m looking forward to reading more of your posts! Thanks Suzanne and Donna, I’m pleased you liked the ideas. Happy hunting! What a lovely post – I have got my eggs but you have saved me the job of coming up with clues. Thank you! Go look under the dining room …(table). @ThriftyNut – a wellington boot! The children had a blast and as they are able to read, I didn’t have to do much! All I had to do was be there (for which read lie in bed) and they raced around finding them then brought back the clues. They didn’t need to as they read them out and after one or two goes, they really got the idea and worked out the answers! Thanks again, clues saved for next year now! we do something similar to find the baskets that the easter bunny leaves – clues are in plastic easter eggs with clues to where the next egg is hidden … each child has one color of eggs to hunt for and i do about six or seven for each … the last clue leads them to their baskets … started this when my son was two and he is now 26! I have been doing this for years since my children were able to read. They are in their 50’s and 40’snow so not I do it for my grandchildren. They love it too. Their last clue leads to their basket. I love watching them run all over the house upstairs, downstairs, out the front door and out the back door and the excitement when the find there basket. There are 9 of them so it can get kind of wild but so much fun. GREAT clues! My mom was an English major, and we grew up with clues – sometimes that were very challenging to figure out – but we loved them, even venturing to the neighbor’s house as we got older. Now, I’m doing them for my 3 kids – began with just pictures before they could read and now various riddles. Every year I’m racking my brain for new ones and now I’ve got some! Hi does anyone have any clues for a Hunt around a garden with lots of bushes? 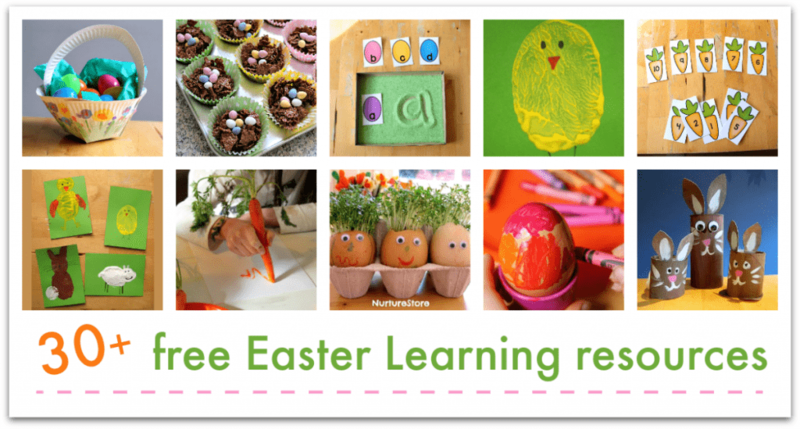 What about drawing out a treasure map – for Easter bunny pirates – x marks the egg! Thank you so much for sharing your egg clues! We did this with my kids today and they had so much fun 🙂 Happy Easter! We give each kid a colored cone of string or yarn that we have strung all over the house—upstairs and in the garden. The strings go over trees, under bushes, around cars, and cross over each other. They end in a hidden place with their basket. Older kids pair with little ones and wind string on a wooden dowel. It is wild and tricky stepping over, under and around other strings but kids love it and ask for string game each year. The parents have fun stringing the whole mess!